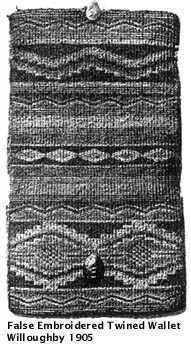 In Charles C. Willoughby's 1905 article "Textile Fabrics of the New England Indians" American Anthropologist 7:1 he examines an excellent example of twined weaving embellished with moose-hair; a two-fold wallet that was made by Mollocket from Oxford county in western Maine, a member of the Anasagunticoolk tribe of the Androscoggin valley. Lined with green flannel, the wallet has a silver hasp with the date 1788 engraved on it that was made by a local silversmith. The twined wallet is extremely closely twined, and the exterior surface is covered with "false-embroidery" in moose-hair using the natural white color and hair dyed with red, green, blue, and yellow. 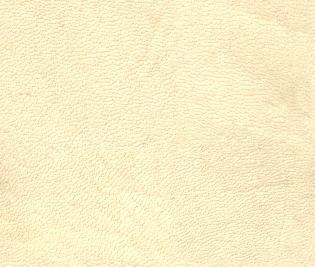 The warp and woof elements are all made of Indian Hemp or dogbane cord. The twining is achieved by twisting the two woof elements once around each warp strand in an overhand direction. If left undecorated, this creates a pattern in the woofs which slant from the upper left to lower right on the outside of the twining. 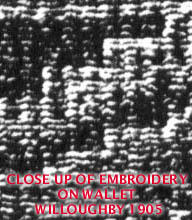 The decoration Willoughby (1905) terms "false embroidery" is created during the weaving process, and not applied separately to the finished surface. Perhaps more aptly called "hair wrapping", the effect is achieved by winding the moose hair around the outer woof-cords. 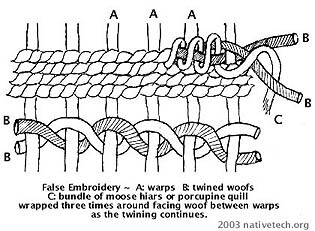 When a woof element comes to the outside of the weaving, a bundle of a few moose hairs is wrapped around it three times. With such extremely tight weaving, the warp is concealed and so are the exterior woofs completely wrapped with moose hair. With the hair wrapping in the opposite direction than the twist in the woofs, the resulting pattern in the wrapping slants from the upper right to the lower left. There is no evidence of the hair wrapping on the inside of the wallet, except for the ends of the hairs which have 'run out'. As new hairs are continually added to the bundle of hair used to wrap the woofs, and as the hairs lengths are used up or a color change is necessary for the pattern, the remaining short ends of the hairs are put toward the inside of the work, and trimmed tight against the work. 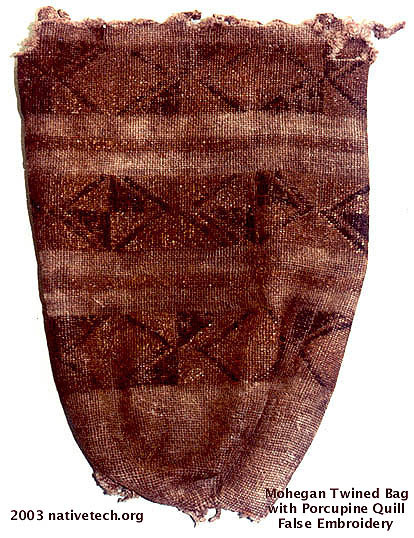 This false embroidery technique is similar to that of Nortwest Coast tribes' ornamentation of their twined bags, the difference that these peoples only wrapped the woof once with the embroidering bundle. The technique lends itself well to the geometric patterns, while true sewn embroidery in moose hair or porcupine quills on leather generally consists of more curvilinear and floral patterns. Willoughby (1905) notes that the false embroidered twined bags of the eastern woodlands are most likely what John Josselyn observed as "bags of porcupine quills woven and dyed." There are two Native twined bags from 17th century southern New England which have survived. 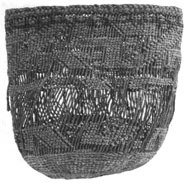 A small Moghegan twined storage bag, made by Cynthia Tecunwass, probably used to hold corn powder (Yohicake) or other household items, is woven with an open bottom which was later sewed shut. It is decorated with a pattern of false embroidered diamonds and triangles of black or purple dyed porcupine quills. 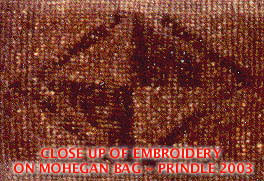 A Narragansett bag has a similar geometric design is from the same time period, but doesn't have false embroidery. This bag was twined by a Narragansett woman around 1675 and was given to the wife of a Mayor. The pattern on this bag is achieved by twining corn husk and red or blue wool woofs on a basswood cord base. In Willoughby's later 1938 articles, "A Mohawk (Caughnawaga) Halter for Leading Captives" in American Anthropologist January-March, 1938 Vol. 40(1): 49-50. He describes the twined prisoner halter in the Memorial Museum at Deerfield. Twenty-two feet of braided length with a wider twined section comprising the collar area, false embroidered with dyed and natural moose hair, and edged with white glass beads.